Let’s face it. If the IT landscape is increasing in complexity, configuration of systems and devices is not getting easier. In remote sites, it gets even more complicated—requiring expensive IT experts to travel from site to site and take systems offline. Then the local system redesign and re-configuration need to be tested, validated and approved before any device is deployed. It all adds up to…Downtime. But SteelConnect solves all that. SteelConnect, Riverbed’s next generation SD-WAN product, enables cloud-based, centralized, policy-driven hybrid network management for organizations of all sizes. SteelConnect eliminates the manual configuration of routers. Instead, it employs a menu-driven simplified design and workflow, centralized management and a single business policy, and automated zero touch deployment that allows IT to build and implement software-defined network overlays – remotely from the management console. The ‘touch’ required to deploy a SD-WAN or SD-LAN and provision resources (apps, sites, device and policy) can decrease by up to 90% with SteelConnect. The simple workflow and virtual design uses the concept of shadow appliances as placeholders for physical devices. 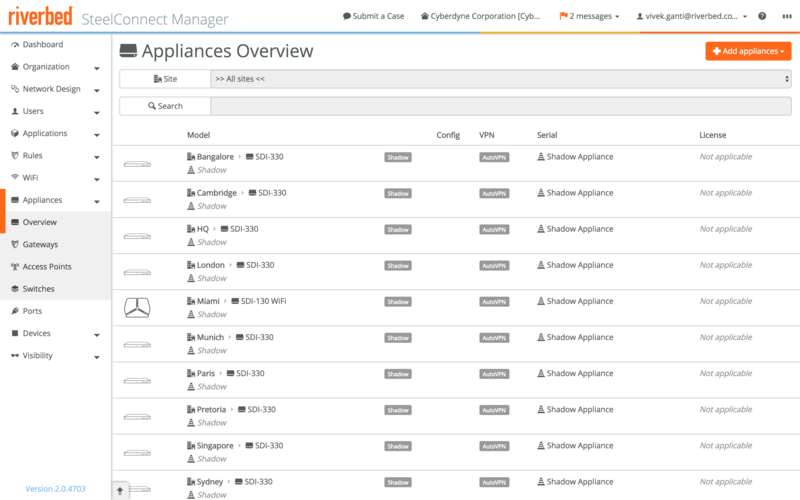 The shadow appliances can be configured and used in centralized fashion from the cloud-based management console just like physical appliances and can be automatically deployed backed by physical hardware. Any number of Shadow Appliances can be added to an organization to facilitate planning and configuration before deploying a physical network solution. And changes to the designtake seconds—altering the policy or adding or removing Shadow appliances during the design or after deployment as needs evolve. The benefit: little or no downtime in branch or remote sites with real-time deployment and provisioning. Ubiquitous and unified connectivity: SteelConnect provides software-defined and application-defined end-to-end connectivity that spans WAN, cloud networks and branch LAN/WLANs. SteelConnect’s dynamic native routing over network overlays can reduce reliance on traditional routers and manual coding, thus decreasing complexity. Business-aligned orchestration. Apps, Users, Locations, Performance, Security. SteelConnect provides centralized management with unified and integrated visibility and business intent-based policy enabling automation, zero touch provisioning, network QoS, quality-based path selection, security, and application optimization. Cloud-oriented workflow: Design first, then Deploy, Change with ease. SteelConnect enables network architects to first virtually design their environments and networks before deploying a single, self-programming piece of hardware to any remote location. Intelligent use of a ‘shadow appliance’ ensures quick deployment of the actual physical appliance. Single-click cloud deployment seamlessly accelerates cloud-to-cloud and cloud-to-datacenter performance.